You've probably noticed how trendy colored walls have become. I for one am a fan of this, when done correctly. This green wall is a nice example of added wall color done right. 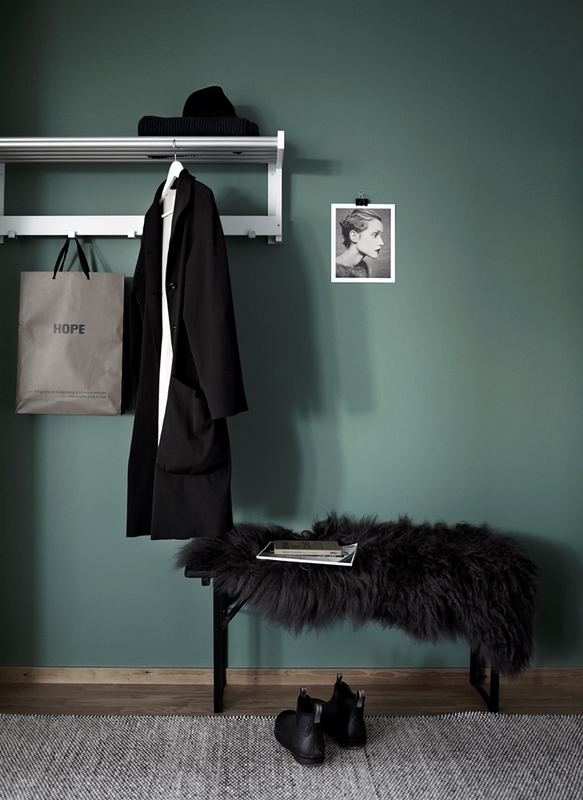 Paired with black textures and in a deep shade of green, it's still muted and not overwhelming. See the entire place here and notice that this is a single green wall, not an entire house or room. In that sense I think it works really well and not high commitment, it can easily be painted over again to change the color. Major green love here! Love this colour, would make a great statement wall! We're thinking of painting our (newly remodeled) bathroom almost this exact color! do you know what the name of this color is?? Yes, am definitely loving this shade! What a beautiful wall that was painted right there. I wonder though, how many coat of paints were used for that wall? Looking at it sure gave me some ideas about what I may want to say to the painters who are coming to my house to paint the walls of my whole living room. I'm in love with this color green! Can you please tell me which color this is? Where can I get it?